They say that humans might live here, but in these four walls, I found myself an unbeliever in the building’s life expectancy. The apartment swallowed me up each day and if I opened a window to let in a breeze or the afternoon sun, I heard too well the sounds of shattering glass and car alarms. And exuberant pop music bouncing out for miles from the cars and the bodegas on the busy street below. In my retirement, I had moved south from Cobble Hill to save on rent, traveling further south several months out of the year to winter on the Atlantic with friends from my knitting club. This first fall, I found myself stuck inside, waiting for winter’s release. 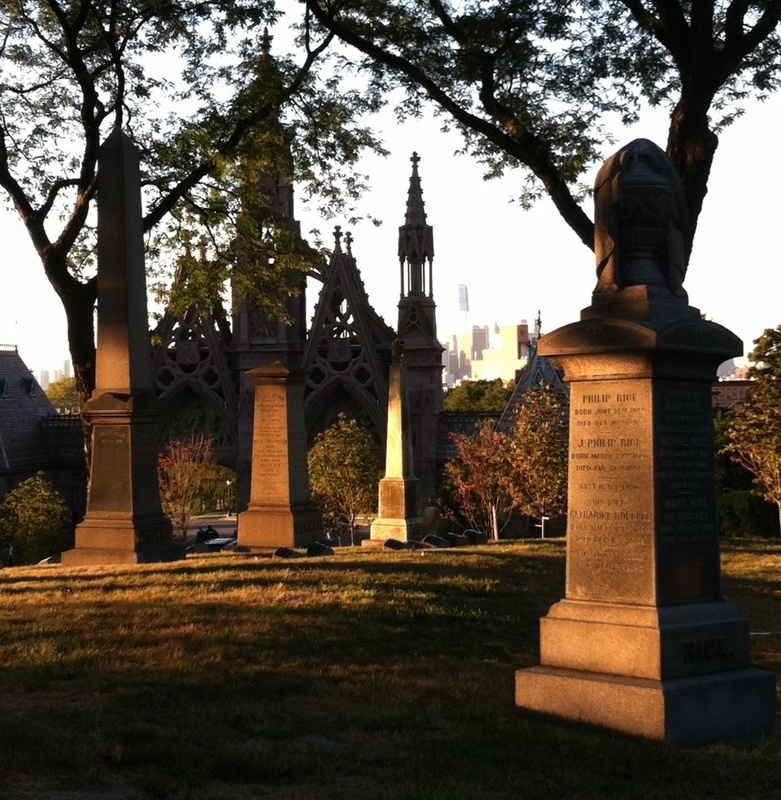 One early evening, I struck out of my dubious home to join the ruckus for a moment until I reached nearby Green-Wood Cemetery, the quietest plot of land—I’d been always been told—in Brooklyn. As I walked alone to the cemetery—alone is a native New Yorker’s happy alternative to the word lonely—I inspected the younger white people who were climbing home from the 36th Street subway. These masses of displaced young people were the city’s walkers. And buyers. A gal at the knit shop—another one of the masses—told me that she felt that this city was open only to a special class’s purchasing pleasure. “The city is open for business,” I said saucily. I was a bit annoyed with her attempt to express solidarity with me. As if anything we said or thought could make the money island come to us. When you aren’t expecting it, the cemetery’s arches appear up on the driveway’s incline. I noticed birds squawking and flying to the top spire of the entrance. Once I neared it, I saw that nests had been built in the tucks of the spire. A green parrot here and there clung to the nests and chewed on the twigs. After I passed under the entrance and walked into the graveyard, a view of Manhattan rose up in the distance. But here I was making a disturbance of my own; twigs with dead leaves rattled when I stepped on them through the acres and acres of gravestones. While I had never visited the cemetery, I did not fear graveyards. I feared the walkways, but I proceeded carefully. Once I had walked for about half a mile, I sat down against a tree trunk to catch my breath, and that was when my skin began to prickle. Acorns plummeted to the crispy leaves under only a slight breeze and they seemed to rush toward me with a human-like pattering of feet. Crickets started up half-heartedly and then stopped as if under surveillance. The whole cemetery was far too still. 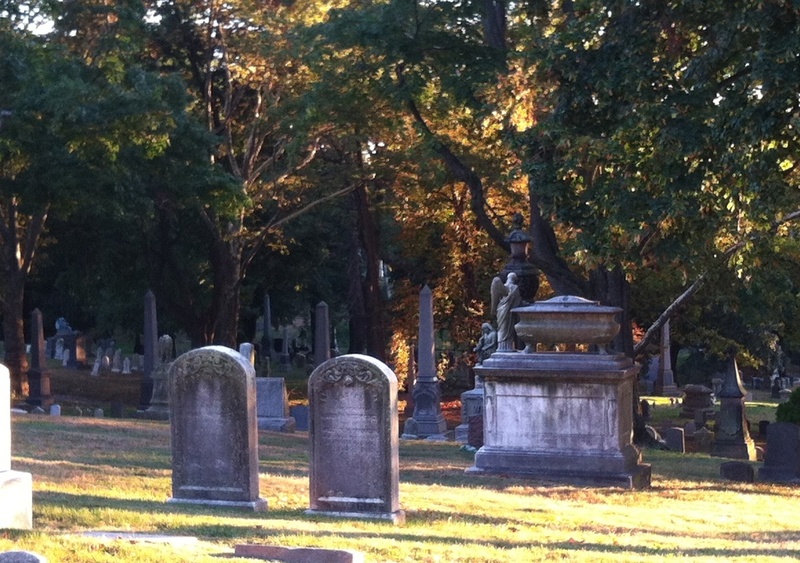 Why in the world had I conceived that wandering out into the graveyard at sunset would be an innocent stroll? They seemed to be living bodies. An angel, there, not five yards before me clasped her hands to her chin in prayer, or in a penitence not right for her age. In the distance, an ice cream truck tinkled a tune. Closer than that, a train had been bellowing, but ceased. Closer and closer, an ambulance wailed. At the top of the hill, they waited for me. A crypt seemed on fire under the sun. I envied its occupants for their transformational glow, like the Carolina beaches I would have to wait for until December. A tall, thin saint—or another angel, perhaps—was a lengthy figure beyond. I could not fathom the stillness. Yes, with an interruption or two in the distance, but still too far to save me the shock of those falling acorns. I did not know the dead could have a home so very much their own. What must this place be like in the winter I’d never stayed for? Colorless, I bet. Sharpened wind. Lonesome. And in 1838? I walked out of the cemetery at last, stupefied. The green parrots had roosted by now (it was almost 7:00) and a few security guards joked around at the gate in Spanish. I paused for a moment outside the gates for one last look. One of the guards strolled over to the front gate, cigarette planted between his lips as he locked up. I think his expression, when he glanced my way, was one of fatigued amusement. How could you sleep here, companionable bodies? 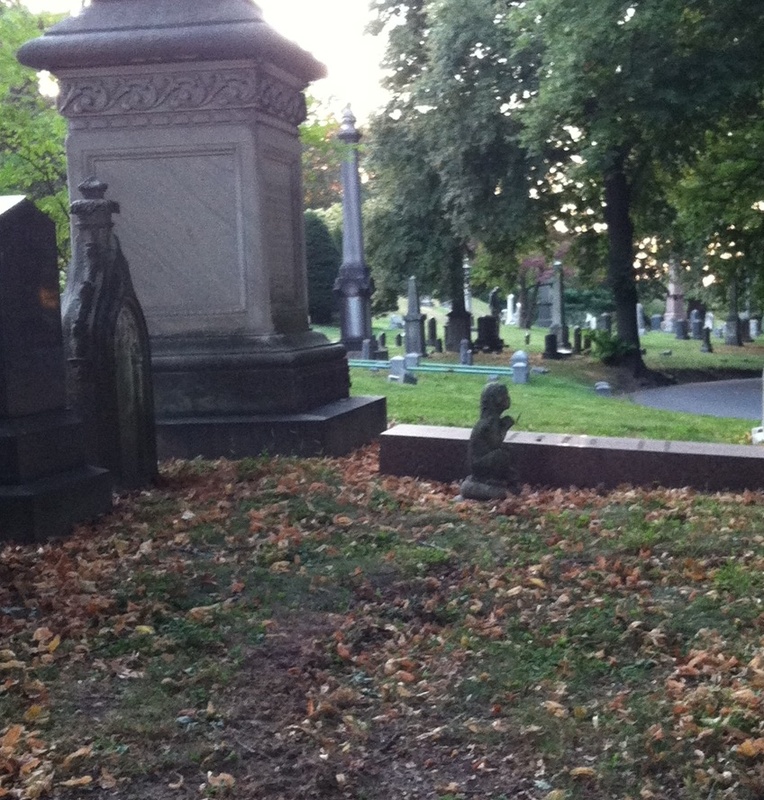 That was the last question I asked Green-Wood Cemetery before walking back to my canister home. Cemeteries are hold so much history and character about a city. Hundreds of years of people…some that have lived in the area their entire lives! Perhaps she was deciding where she wanted to be buried after her time came? As usual a great read! Can’t wait for the next! What a unique, rich depiction of what it is like to walk through a cemetery. I really enjoyed reading! hello, great post-how many spirits do u see? I see 3 and 2 sets of eyes.My mother took me by a cemetary plot in N.C that was specifically for her family. I feel you on the loose dirt& having to watch your step.absolutley stunning.